Bunny Runs with Scissors: Poinsettia in a Pot! 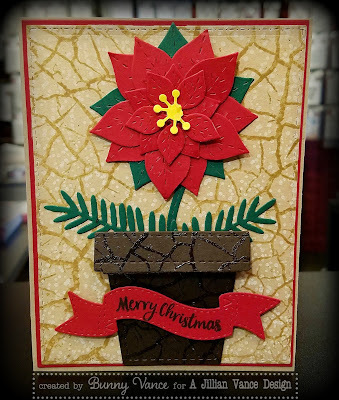 I just love this new Poinsettia Die Set and Flower Pot Die Set! You will see more cards using that Flower Pot Die Set for sure and not in the traditional way! So many possibilities! I used the medium petals, layered them with the small to create this perfect card sized poinsettia! The Laurel Leaves act as pine branches! To find out more, check it out HERE on the A Jillian Vance Design Blog! Now that is amazing Bunny!